Royal Caribbean has closed the new SkyPad feature due to safety concerns. It is currently on three cruise ships including Spectrum of the Seas which is entering service next week. The Miami-based cruise line has confirmed via social media that the new SkyPad feature is indeed shut down. The news first broke from the popular Royal Caribbean Blog web site. This comes after 26-year-old Casey Holladay was enjoying the SkyPad aboard the newly renovated Mariner of the Seas in February 2019 out of Miami, Florida. According to the lawsuit, the cords suddenly snapped with Holladay dropping 20-feet to the deck below. He was injured and needed further medical attention on land. The footage was captured on video too. The suit is still ongoing and Holladay is suing Royal Caribbean for $75,000. According to suite details, he’s suffered long term injuries which could impact his daily life. SkyPad was added to Mariner of the Seas during a huge multi-million dollar dry dock upgrade in June 2018. 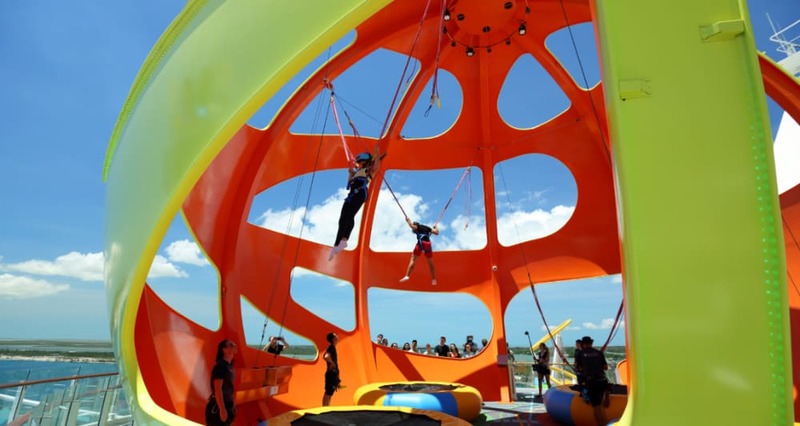 The bungee trampoline experience is located on the open deck at the aft of the ship. It offers a virtual reality experience for guests as they bounce with a headset on. Guests of 5 years and above can use the feature. The newest Royal Caribbean ship Spectrum of the Seas features SkyPad for when it debuts from Barcelona, Spain on April 18, 2019. Independence of the Seas which was upgraded in April 2018 also has SkyPad. Cruise Hive will monitor any updates from the cruise line for when the feature will be back open for guests to enjoy once again.